How does it feel like being a monster from birth all the way to death? What choices will you make? Will you be nice or will you be nasty? Check out their trailer below and head on to the Nintendo Switch eShop here tomorrow to be the monster you always want to be. Monster loves you!, a monsterous simulation game about raising monsters from birth to death (and the spaces in between) is landing on Nintendo Switch this Sunday – September 30th! Monster Loves You! is now available for Switch! The hit game, think an interactive novel full of humor and charm, is finally available for Switch gamers with both touch and joycom support. Brought to you by Radial Games and Dejobaan Games who’ve been making great games together since 2012, Monster loves you! let’s players mold monsters into cuddly buddies… or the kind that hide under your bed ready to nip on ankles. Live the life of a Monster — from birth to elderhood and beyond, making decisions that affect the world of Monsters and Humans. Solve problems, befriend animals and interesting people, and make friends. Or eat them. Hey, this is your story! As a Monster of the village of Omen, your favorite snack is the fingers of small children and you chance to pop up in the most interesting places! What do you do when three angry bears discover a young child in their cabin? Or when you spy a wolf hunting down that woman with the red cloak? As a Monsterling, your choices are simple ones. Do you chase those poor little mice (+1 Ferocity) or protect them from the dogs (+1 Kindness)? Do you come clean about that fungus your friends ate (+1 Honesty) or cover for them (+1 Bravery)? As a young monster, your choices determine your personality. But all youngins must grow up. Monsters and Humans have been at odds for centuries, and there are Human villages on the other side of the enchanted woods. When Human children get lost in those dark and winding thickets, do you terrorize them for fun (+1 Ferocity)? Do you help return them to Human civilization to prove that not all Monsters are to be feared and hated (+1 Kindness)? Or do you fatten them up for Human foie gras? All this, to the backdrop of increasing tensions between Monsters and Humankind. · Balance Bravery, Cleverness, Ferocity, Honesty, Kindness, and Respect to wield political power. · Over 900 choices to make. Devour Little Red Riding Hood. Gobble up Hansel and Gretel. Eat the Three Little Pigs. Each choice you make will determine the monster you become! 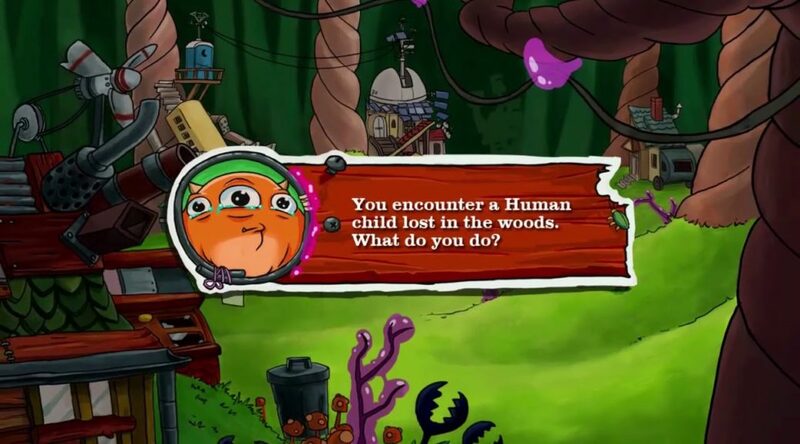 · Encounter different adventures each time you play, with over a dozen possible endings. Bonus: Become a Neurosurgeon without having to attend medical school. That’s value!